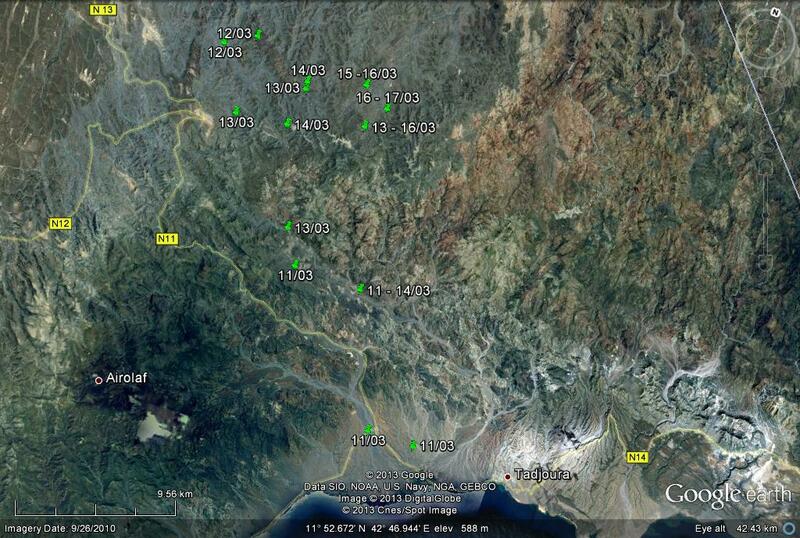 Movement of adult Egyptian vulture 11-17 March 2013. Dates are dd/mm. The map above is a summary of the movements made by Assamo (NOTE: Dates are in the form of dd/mm). In actuality there were many more locations in clusters around the points shown on the map. We removed most of the locations to make the map clearer, and labelled locations with the data or range of dates when the bird was there. So, we can see that Assamo has moved around a lot, moving between locations within one day, and sometimes spending more than one day at a location. Some locations were revisited. During this time it had moved up to about 40 km away from the location where it was trapped at Tadjoura. We know that the abattoir at Tadjoura is a reliable source of regular food, so maybe this bird has been discouraged from returning there because of the capture. However, our observations seem to suggest that not all vultures that are near to Tadjoura visit the abattoir every day, so what we might be seeing in this map is just normal behavior.